A new bio-economy is emerging in the Pacific Northwest with the help of microbes that turn wood into acetic acid, which is a high-value chemical used in many everyday products. These industrial microbes may also be part of a conversion process that can someday produce other bio-based chemicals and biofuels. The microbe Moorella thermoacetica is similar to those found in compost piles and in the digestive systems of termites. Because the microbe can reabsorb CO2 generated during fermentation, it is extremely efficient at fermenting sugars from wood into acetic acid. Researchers at the University of Washington prepare inoculate for the fermentation process. As part of the Advanced Hardwood Biofuels Northwest project, ZeaChem is working to improve various aspects of M. thermoacetica fermentation: increased yields, faster production, resistance to growth inhibitors, and more. Recent scientific developments, such as the sequencing of the M. thermoacetica genome, have uncovered a number of valuable genetic targets that may potentially impact the microbe’s performance. But knowing Moorella’s DNA sequence isn’t the same as knowing what to do with it. In some cases, even when you’ve found the right gene, it is hard to know how that gene should be modified to give you the result you want. As with virtually every other industrially-important microorganism, there is more that is unknown about the organism than is known. How can we improve the organism if we don’t even know which specific changes to the DNA sequence (i.e., which mutations) are needed? We can do it by letting the cells find the good mutations for us through evolution. The cell’s DNA replication machinery isn’t perfect, and it occasionally makes mistakes while generating copies of the chromosome. 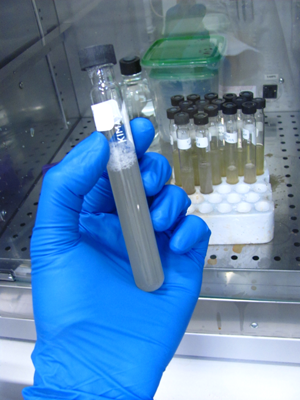 In fact, a typical tube of Moorella culture can include millions of mutant cells, each with its DNA altered in a slightly different way. Most of the mutations have a negative impact on the cell’s performance, but in rare instances a beneficial mutation arises. By creating conditions that favor those mutants with the desired traits, the mutant Moorella cells can outgrow their competitors and eventually dominate the culture. Each tube of culture contains billions of cells, including millions of mutants that might make conversion processes more efficient. Often, the cells come up with more than one way to solve a single problem – for example, some mutants may alter their membrane structure to deal with growth inhibitors, while others may increase the production of stress response proteins. We can isolate the different mutants in the culture by diluting the culture and plating it onto petri dishes, so that each cell grows up to form its own colony. Specialized “high throughput” screening methods can then be used to evaluate hundreds or thousands of these colonies at a time, and pick out the winners with the desired traits. Following validation, the mutations associated with the desired traits can then be combined to obtain even greater improvements in performance. Through this process, we can improve the performance of Moorella even without knowing beforehand what specific changes to the DNA were needed. Nature relies on complicated networks and interactions that can exceed our rational capacity, but fortunately nature also provides built-in tools to help us manage and navigate that complexity. Sometimes the cells themselves can tell us which direction to take.